It was in the year 1797, with the arrival of Spanish settlers, that the history of San Juan Bautista began. A Roman Catholic pilgrimage, led by Father Junipero Serra, was to bring Christianity to the wilderness. The Franciscan Friars chose the site of the 15th and most spectacular mission at the foot of the Gabilan Mountains, which they named Mission San Juan Bautista after St. John the Baptist. They wasted little time in bringing the Catholic religion to the local Mutsun Indians. Around the mission grew a thriving pueblo, which became a mecca of travel and commerce. In its heyday, San Juan Bautista had enough clout to sustain four newspapers and 17 saloons. Every hour, a stagecoach rumbled into town; bringing with it padres, vaqueros and banditos, as well as historical figures such as Susan B. Anthony and Civil War hero William T. Sherman. Upon the arrival of the Southern Pacific Railroad to the nearby city of Hollister, Old San Juan was bypassed, destined to become a historical landmark of what were the beginnings of civilization in California. "Discover the Pleasure of Visiting Old California"
Only 90 miles south of San Francisco and 35 miles from San Jose, San Juan Bautista is only three short minutes off Highway 101. You will find it filled with many quaint mid-1800s buildings which have been turned into thriving specialty shops, superb restaurants, antique shops and fine art galleries. State Historical Plaza is located across from the Mission. You will experience visiting such original buildings as the Castro Adobe, the Plaza Hotel and Stable with its fine collection of buggies and wagons, and the old blacksmith shop where horseshoes were made for the stagecoach horses. 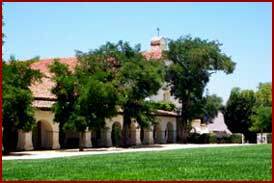 As you stroll across the Plaza, you will see the picturesque Mission San Juan Bautista which was founded in 1797. It is still an active church with many activities and festivals each year. Come visit San Juan Bautista. "Shop for Today While Walking Through Yesterday."